So, why should you join CAMUS? It is all about Users Helping Users! If you are a MANMAN user (or MK or MAXIM), you may feel somewhat alone when looking for an answer to a question (or often an error message! ), or looking for a solution to a business need that would involve modifying MANMAN or enhancing it with an add-on product or service. Well, CAMUS members are here to help! We have new users, experienced users, IT users, non-IT users, and we also have a number of members who are 3rd party solution providers. We pride ourselves with how quickly and effectively we respond to other users’ MANMAN questions. And these questions need not be restricted to MANMAN/MFG/OMAR/AP/GL or other modules. You can get answers to the many 3rd party add-on modules that are out there. IT users can get answers to programming and system-related questions. The easiest way to get an answer to a MANMAN question is to sign up with our free email list server. Then send an email with your question to a single email address, which will be received by over 300 MANMAN users. Typically, you will see several responses the very same day! CAMUS also holds a Virtual (webinars-type) user group meetings each year. These “VRUG” meetings are free and feature both a roundtable discussion from our members, as well as a presentation of topics, usually by a couple of 3rd party solution members. Access to the secured members’ only section of the website does require membership. For regular members (users of MANMAN or MK) access is FREE with the submission of a profile form which will be posted in the members’ only section. For associate members (third party solution vendors) access is available for $100/year along with posting a directory listing on the homepage. Access to other sections of the website are free, as are the list server, and VRUG meetings. Being a member of CAMUS affords you a unique opportunity to learn from other MANMAN users. You will have the opportunity to make contact with 3rd party solution providers and learn about numerous add-on products and services that enhance MANMAN and prolong its life. You will also have the opportunity to get to know Infor, the company that now owns MANMAN. Finally, if your company is looking to migrate from MANMAN to another ERP, we have a number of members who are in that process. 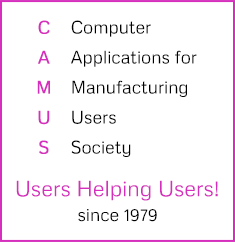 CAMUS is run by an all-volunteer group of regular and associate users. We all have regular jobs, which all involve MANMAN, and so we know the value of being able to ask and get answers to MANMAN questions! We are committed to helping you and to provide a forum where users can help users. It is what we are all about. If you have any questions about joining CAMUS or about the benefits of membership, please feel free to contact me! After confirming your membership, we will send you an email. © 2019 CAMUS, All Rights Reserved.